To help staff and volunteers of small associations, non-profits and other membership organizations we provide a wide range of free webinars and resources. Feel like you could be doing more to promote your events? In this webinar we'll teach you how to use all the features of Wild Apricot to publish and promote your events. You can register for this free, one-hour webinar - here. We've also recently launched a series of how-to guides for those who are new to Wild Apricot or taking on new volunteer responsibilities. 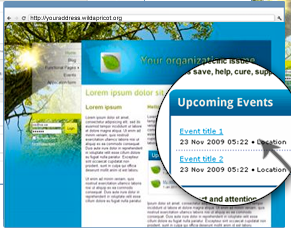 The series includes our Getting Started With Events guide which takes you through our events module - so you can set up one or several events, publish them online on your Wild Apricot website (or another website) and offer online self-service registration. Stay tuned to the Wild Apricot blog for more information on free webinars and other helpful Getting Started Guides.